Some men could care less what's on their feet for socks. Well let me tell you my husband is not one of those men. He's very picky about his socks not just the way they fit but also the way they feel. He's on his feet for 10-12 hours a day so he has to have socks that keep his feet dry and comfortable. With Gold Toe socks he gets that comfort and his feet stay dry all day. They are made with a special blend of fibers that help keep his feet from sweating and he loves them. He said he also likes that they offer so many different styles of socks so he can wear short ones with his sneakers and shorts, and longer socks with his slacks and boots at work. Happy feet means a happy dad in our house. 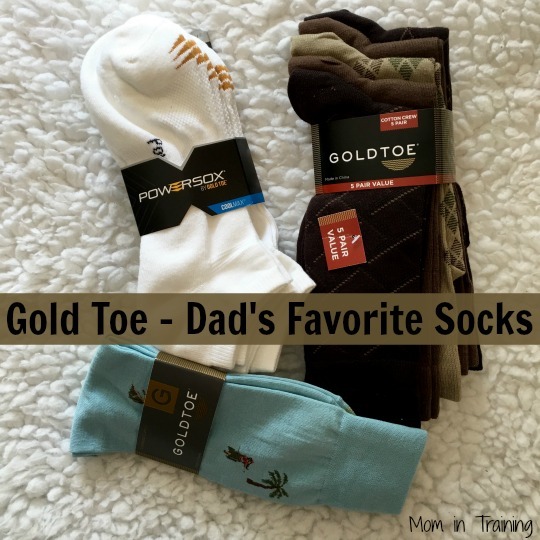 I usually buy my husband Gold Toe socks for Father's Day and Christmas as one of his gifts. They last longer than any other brand. Gold toe socks are awesome. All of my husbands dress socks are Gold toe.